Hello there! 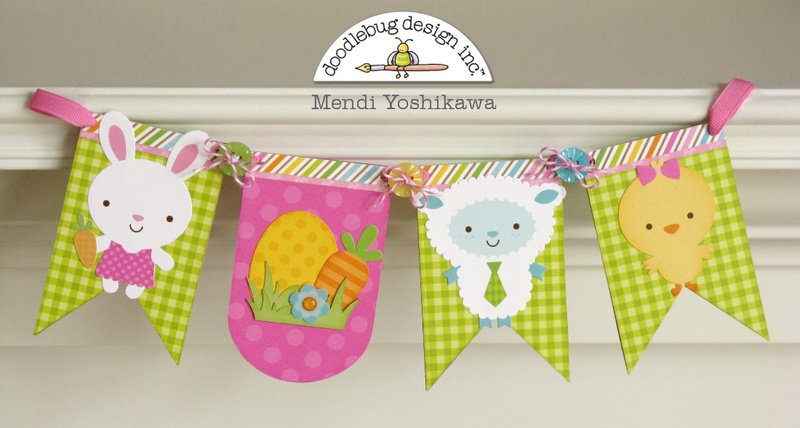 It's Mendi here today with a Spring project inspired by the amazing Shellye McDaniel! 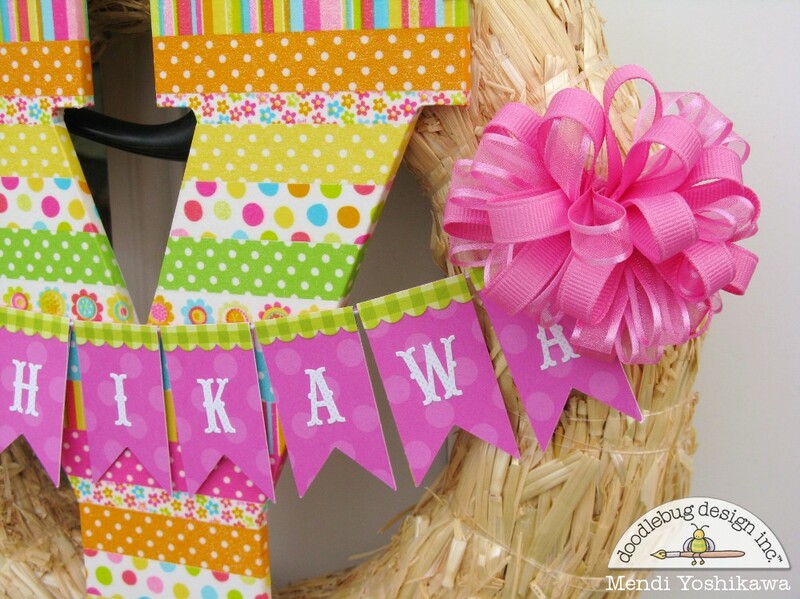 I was completely taken with her idea to cover an inexpensive wood monogrammed letter with washi tape! Here's a peek of Shellye's amazing wreath that my design is based on (pinned HERE). I fell in love with her idea immediately and for almost two years now I have been wanting to make one of my own. I love how easily her design translates to any season depending on the washi tape used. I chose to tie my letter to the back of the wreath using Doodle twine making it easy to switch out with the seasons. I wanted to make some big bows to secure my banner in place, but truth be told, I'm not usually very good at making them. I was tickled to discover a very easy tutorial (shared HERE) which helped me create them with very little effort. For my smaller sized bows I used (36) 3" lengths of ribbon per bow which means you will need 3 yards of grosgrain and 3 yards of sheer ribbon to make two. 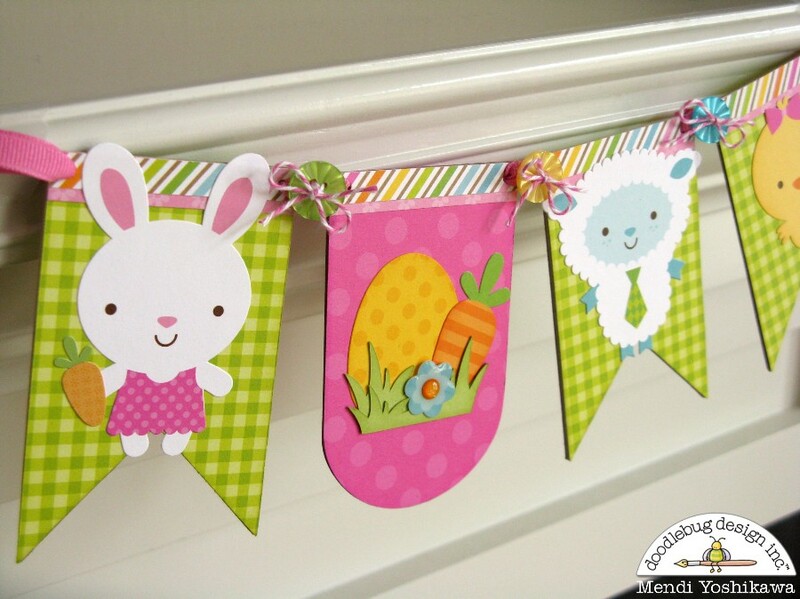 While I had my spring papers out, I created a coordinating chipboard banner using the darling papers and craft kit from the Easter Parade collection. I kept it sweet and simple, but I can't help smiling when I see these adorable critters. To connect the banner pieces together I created a loop with the same grosgrain ribbon, gluing them together in the back. I then threaded a needle with some Doodle twine and sewed buttons onto the ribbon loops. Mendi...love your version of Shellye's wreath! Such a great project... and your banner is just too cute! Oh, MY!!! What super duper cuteness is this!!! Love the way you got inspiration from Shellye but then took it farther and made it your own!! Love the colors and how it just is so perfect for the brightness of Spring and Summer!!! And then to create the adorable banner that you did just is icing on a most incredible wonderful cake!!! Kudos to you!! All of this is just too adorable .... Doodlebug cuteness at its best!!! I really love this project!! The colors are great, súper!! Both of these are adorable!!! WOW - FABULOUS wreath & banner Mendi!!! 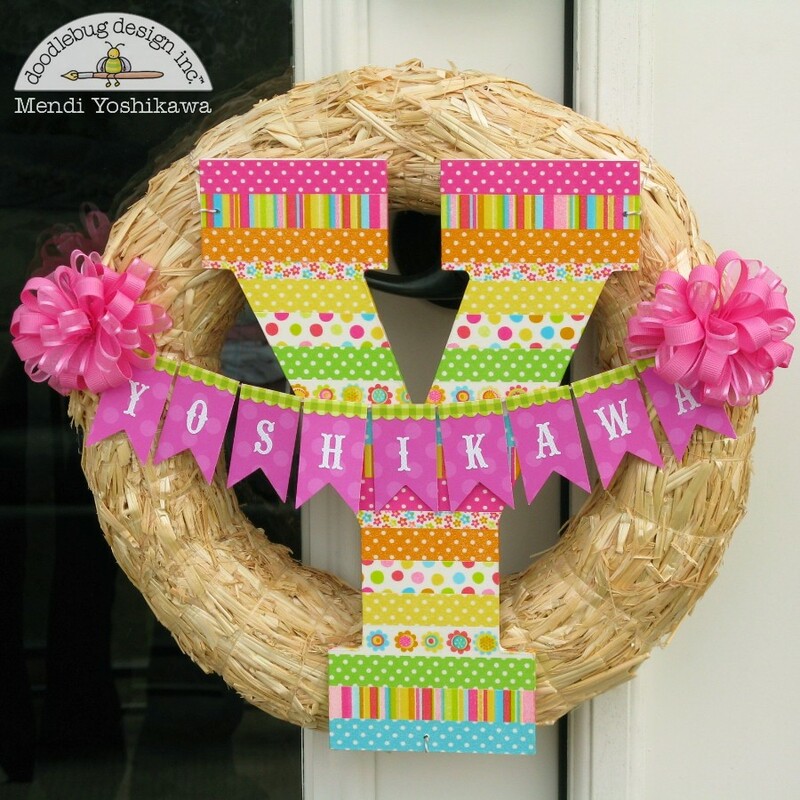 LOVE your HUGE washi "Y", finished off perfectly with the little banner and big bows!! !